Medical implants, complex interfaces between brain and machine or remotely controlled insects: Recent developments combining machines and organisms have great potentials, but also give rise to major ethical concerns. They are known from science fiction novels and films – technically modified organisms with extraordinary skills, so-called cyborgs. This name originates from the English term “cybernetic organism”. 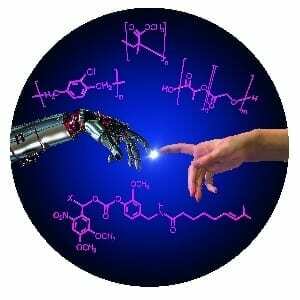 In fact, cyborgs that combine technical systems with living organisms are already reality. The KIT researchers Professor Christof M. Niemeyer and Dr. Stefan Giselbrecht of the Institute for Biological Interfaces 1 (IBG 1) and Dr. Bastian E. Rapp, Institute of Microstructure Technology (IMT), point out that this especially applies to medical implants. In recent years, medical implants based on smart materials that automatically react to changing conditions, computer-supported design and fabrication based on magnetic resonance tomography datasets or surface modifications for improved tissue integration allowed major progress to be achieved. For successful tissue integration and the prevention of inflammation reactions, special surface coatings were developed also by the KIT under e.g. the multidisciplinary Helmholtz program “BioInterfaces”. Progress in microelectronics and semiconductor technology has been the basis of electronic implants controlling, restoring or improving the functions of the human body, such as cardiac pacemakers, retina implants, hearing implants, or implants for deep brain stimulation in pain or Parkinson therapies. Currently, bioelectronic developments are being combined with robotics systems to design highly complex neuroprostheses. Scientists are working on brain-machine interfaces (BMI) for the direct physical contacting of the brain. BMI are used among others to control prostheses and complex movements, such as gripping. Moreover, they are important tools in neurosciences, as they provide insight into the functioning of the brain. Apart from electric signals, substances released by implanted micro- and nanofluidic systems in a spatially or temporarily controlled manner can be used for communication between technical devices and organisms. Brains of lower organisms, such as insects, are less complex. As soon as a signal is coupled in, a certain movement program, such as running or flying, is started. So-called biobots, i.e. large insects with implanted electronic and microfluidic control units, are used in a new generation of tools, such as small flying objects for monitoring and rescue missions. In addition, they are applied as model systems in neurosciences in order to understand basic relationships. Electrically active medical implants that are used for longer terms depend on reliable power supply. Presently, scientists are working on methods to use the patient body’s own thermal, kinetic, electric or chemical energy. In their review the KIT researchers sum up that developments combining technical devices with organisms have a fascinating potential. They may considerably improve the quality of life of many people in the medical sector in particular. However, ethical and social aspects always have to be taken into account. April 8, 2019 - Alum studies medieval puppets, cyborgs The Brown Daily HeraldThe worlds of medieval Christianity and science fiction collided in a lecture by Michelle Oing '07 last Thursday evening. April 13, 2019 - Cyborgs will lead us into space, says astronomer royal The TimesHumanity's foray into deep space is likely to be spearheaded by super-intelligent cyborgs capable of self-reproduction, according to the Queen's astronomer. April 17, 2019 - Holovis announce the unveiling of Cyborg at Madame Tussauds BlooloopHolovis has announced the unveiling of the final superhero to join the Justice League: A Call for Heroes experience at Madame Tussauds Orlando. April 16, 2019 - Cyborg and Flash added to Justice League at Madame Tussauds Orlando Attractions MagazineThe entire Justice League has united inside Madame Tussauds Orlando at Icon Park with the additions of Cyborg and The Flash. April 1, 2019 - The Whiz Kid Building a Better Cyborg | Rising Stars OZYTyler Clites, 28, has designed a way to make prosthetic limbs that communicate directly with the nervous system.